was born in Stuttgart in 1971 and spent his school days there. He studied classical saxophone, chamber music and contemporary music in Frankfurt and at the CNR Bordeaux/ France with Marie-Bernadette Charrier and Jean-Marie Londeix. His main point of interests lies in the fields of new, newest and experimental music, free improvisation and electronic and computer music. 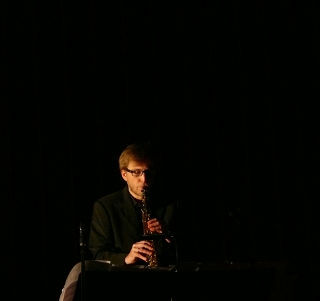 Mark not only regularly performs as a saxophonist but also as an ad-hoc player, performer, composer and electronic technician at important festivals for contemporary music and improvised music, both nationally and internationally. He focuses on the collaboration with the composer and artists of other branches as well as on his own production of all kinds of musical and multimedia concepts. His work is documented in the shape of broadcasting and CD productions. A considerable number of his pieces were premièred by him as a soloist or in various chamber formations. Important persons in his present artistic biography include Alan Hilario, Martin Schüttler, Michael Maierhof, Christoph Ogiermann, Eckart Beinke, Hans-Joachim Hesps, Robin Hoffmann, Hannes Seidl, Thomas Stiegler, Maximilian Marcoll, Fred Frith. A close artistic friendship exists between Mark and the dance performers Claudia Senoner and Fabian Chyle which is reflected in frequent collaborations.